It’s been one of those weeks this week. There was I thinking the first week of the New Year would be a positive one!! First I get embroiled in a crazy debate about tenants scarpering without giving notice to landlords, then another one about whether landlords should allow tenancies to end in December or January…… I should’ve known better really than to even THINK about taking on someone else’s battle. But I did, or started to. One of the Polish lads who had done some work with Team Moregeous was really upset as his very poorly 3yr old had to go to A&E with a serious chest infection. I was told their house was really damp and they’d repeatedly asked for help from their letting agents but it hadn’t been forthcoming, from the agents or the landlord. I was very annoyed on their behalf, no rental house should be damp, let alone damp enough to ensure a child is ill enough to spend time in hospital. I was fully prepared for a battle and to take on a procrastinating agent / uncaring landlord or get in touch with the council / environmental health. Time to visit the property in question and gather evidence! The 3 bed semi was humid and damp even with the windows open. There was black mould on the surface of the wallpaper in the corners of all the rooms and on the cills. 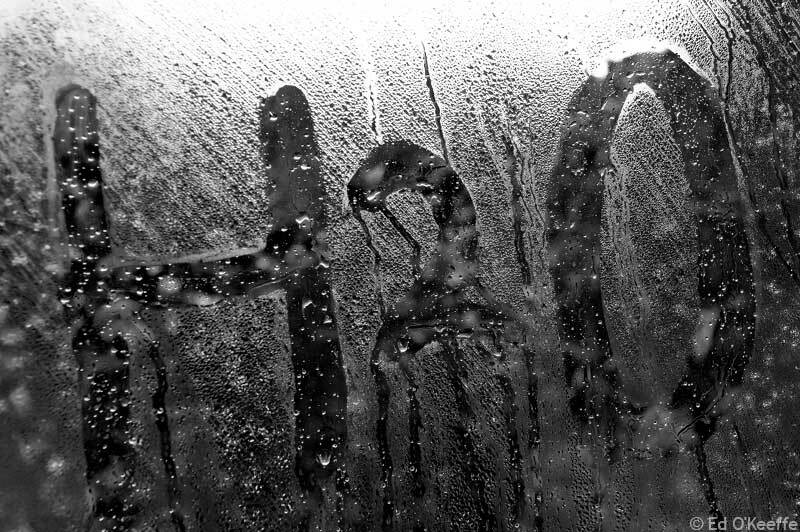 Condensation was pouring down the window glass even though it was double glazed. Drips of water were forming on the shiny vinyl painted ceilings. But despite this I wasn’t angry, not immediately on the phone to the letting agents, not dashing home to fire off incisive emails. I was just sad. Sad because it wasn’t the house’s fault, nor the agents, nor the landlords. It was our fault, and by ours I mean society’s. There were twelve people living in the house. Twelve. Seven adults, four children and a baby in a small house designed for a maximum of 3 – 5 people. Plus pets. As soon as I’d walked in, it was clear what the issue was…. 12 bodies cleaning, cooking, washing themselves, washing clothes, sleeping, perspiring in a house with roof insulation, cavity wall insulation and double glazing – no wonder the poor house and the poor children were poorly, there was simply nowhere for all that moisture to go. There were no changes I could advise because the intense condensation was being caused simply by humans being human and living. Why were there so many people living together in such a small house? Economics. Migration. Rental rules. Credit checks. Affordability. It’s all very well having mass movement of workers and families but this is one of the hidden stories – the cramped and damp living conditions, the inability to change them through language difficulties, lack of credit or rental history and lack of knowledge about how to practically make things better. The installation of a PIV (Positive Input Ventilation) system would help enormously but costs money. Doubtless the tenants don’t know about such a system but wouldn’t want to ask anyway as they have far too many people in the house but can’t afford or are unable to rent elsewhere. So the result – people become ill, the house gets damaged by damp and a young child is in hospital. A crazy situation. In this instance I’ve offered to source a PIV unit at cost for them, speak with the lettings agent and get it installed but I’ll bet this is happening in houses all over the country. It’s like something out of Victorian times, for heavens sake. I’m rarely surprised at what I see, property wise, but this truly had me stunned and saddened. Should landlords ‘allow’ tenancies to end around the Christmas period? Not only is that a health hazard it is a safety hazard (increased chance of fire etc) Is the landlord/ agent aware there are so many people living there? A thought provoking post. It’s shameful that in the west we call ourselves a civilised society when there are so many inequalites and basic human rights ignored.